Looking for a credit card with amazing cash rewards and zero annual fees? 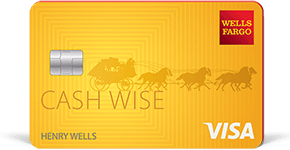 Well, your search has come to an end as the Wells Fargo Cash Wise Visa® Credit Card has got you sorted. With this Visa credit card comes user-friendly features and benefits, making it the perfect card for any low to moderate earner. Let’s dig a little deeper and take a look at the features and rewards this Wells Fargo credit card has to offer, and how you can apply today. To start with, Wells Fargo offers a 0% introductory APR on balance transfers for the first 12 months. So if you decide to move your credit card balance from another bank to your Wells Fargo Cash Wise credit card, you won’t have to pay interest for one year. In terms of cash back, you can earn 1.5% in unlimited cash rewards on all purchases, no rotating category restrictions or quarterly activation required. You’ll also get a $200 bonus when you spend $1,000 in purchases in the first 3 months. Not bad, eh? And the beauty of this Visa credit card is the fact that your cash rewards do not expire, as long your account is open and active. Security? You’re in good hands. Your credit card account is safe and secure with 24/7 fraud monitoring, meaning you will always be alerted in case of any unauthorized transactions, giving you no reason to worry. Sound like a good deal? Well, let’s find out if you’re eligible and how you can apply for this Wells Fargo credit card today. To be eligible for this credit card you must be at least 18 years old, a legal resident of the US and have a social security number. On top of this you will need a regular income and documents to show proof of this. If you are eligible, the application process should only take a few minutes to complete. To apply online, visit the Wells Fargo website and fill out the online application form. Once you have provided all the required information you will receive a notification regarding the status of your application. If approved, the bank will forward more information, including when you will receive your credit card and what your credit limit is. Note that the bank will determine your credit limit based on your income and credit rating. Just like any other responsible card holder, you should pay your credit card on time to avoid incurring extra bank charges. The most common costs involved are broken down below but to get more detailed information, head to the Wells Fargo website. 3%of each transaction converted to U.S. dollars. 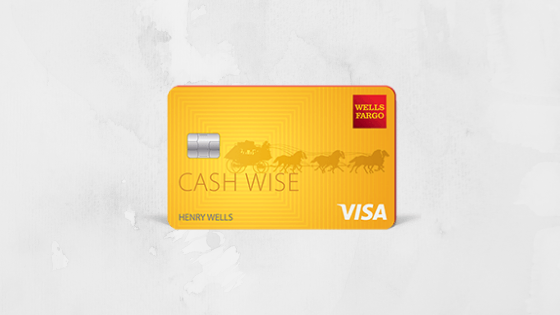 If you are looking for a credit card that offers unlimited cash back and a 0% introductory APR on balance transfers, the Wells Fargo Cash Wise Visa® Credit Card is your answer. Visit the Wells Fargo website and apply today to begin enjoying zero annual fees, extended low-interest, exciting bonuses and more.